One of the lucky few to get VDSL2? We have new plans for you! Attention Australian Capital Territory! Are you struggling with the wait for the National Broadband Network (NBN) to be rolled out in your street to enjoy superfast broadband speeds? Want to move faster than an ADSL connection can handle and want to do so now? Then we have good news for you. For you lucky people in the ACT, we have a technology available, exclusively to you, which means you won’t have to wait for NBN to start reaping the benefits of a superfast connection. 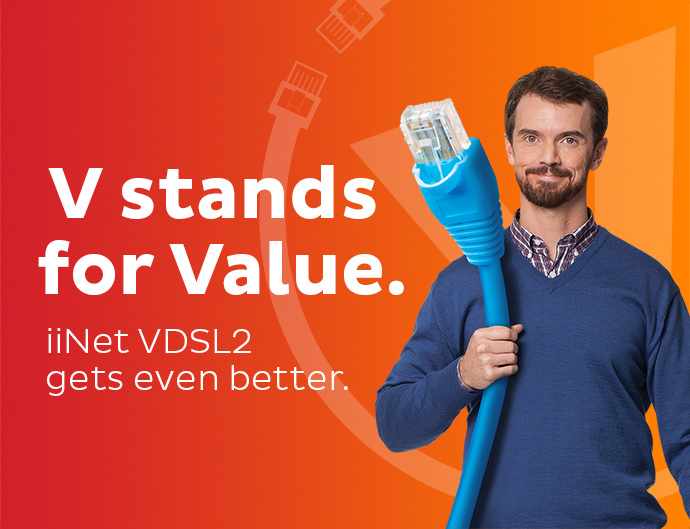 You’ll be downloading quick-as-a-wink on iiNet’s very own VDSL2 network. You may be wondering what VDSL2 actually is and how it differs from ADSL2. VDSL2 is our fibre-to-the-node network, part fibre and part copper, and is available only to customers in the ACT (check here to see if you’re eligible). It provides a faster connection than ADSL, hence its apt full name: Very-high-bit-rate digital subscriber line. So how much faster is it? If you choose our lowest speed plan, the maximum connection speed of an iiNet VDSL2 connection is 30 megabits per second (Mbps) download and 5Mbps upload. This is a faster maximum potential connection speed than any ADSL connection. If that’s still not fast enough, no need to fear: iiNet’s highest speed plan delivers the impressively fast maximum potential connection speed of 80 Mbps download and 40 Mbps upload. We do need to tell you that your actual speed might be lower than those maximums. The speed for VDSL is affected by a range of factors, including the distance that your premises is from the iiNet VDSL equipment, the quality of the copper to your premises, and the number of users on the network. Calls: Includes Local and standard National calls plus standard Australian mobile calls. These new VDSL2 plans are the biggest value yet, with each one beefed up with a whole terabyte of data, Netphone included and an increase in both regular and shaping speeds since our last plans. Note there is a setup fee of $159.99 on no contract, or $59.99 on a 24 month contract. Customers who opt for the 24 month contract will enjoy the added bonus of a WiFi modem included, and all you’ll pay is for the one-off $10 shipping fee. So don’t wait any longer for fast speeds to rival the NBN, head to our website and sign up to one of our great value VDSL2 plans today. For more information check out the full terms and conditions here. Next time you’re having trouble with your NBN Wireless service Jozef, we’d recommend giving our Support (13 22 58) team a buzz so we can run through some troubleshooting steps to determine the cause. Ive got the 80/40 plan, but I only get 35/5. My copper is good(fully replaced >10 years ago) Im 80mtrs from the junction and approx 4.2km from the exchange. So beware of those theoretical maximums. Is it better than ADSL? for sure! ACT already had VDSL with a service provider called Transact which started FTTN back in 2005 and Transact upgraded the VDSL network in 2013 to VDSL2 which I already Have. Well Done to Transact which is now owned by IINET. Sorry to say ACT had VDSL long time ago. “Bugger ACT”? Not a very nice thing to say -especially by someone from SA — the state of churches, the state of good wines, and the residence of Scott Russell-Hill :-). I have the fibre optic cable, owned by iinet for years, terminating on the pole in my backyard but until this announcement iinet has been telling me that I cannot have access to it. Now, at last I have the chance to go beyond ADSL2+ — but only after I have read the available plans, aimed at parting me with my money, and conditions attached thereto . Bugger ACT … Stop whinging … I live in the ACT and NO I can not get it either. We have iinet cable and it beats everything else hands down. Our speeds are the envy of all my friends and the kids’ friends too so it must be fast. Don’t bother with anything else if you have the choice. Never had an issue in over 3 years!